Throughout the Summer, Bryson City offers many options for lovers of traditional mountain music. On Saturday evenings through October, you can take in the free 6:30 pm “Music in the Mountains” concerts at the train depot. And throughout July and August, the Stecoah Valley Cultural Arts Center presents “An Appalachian Evening”, the annual Summer concert series, now in its 12th season. 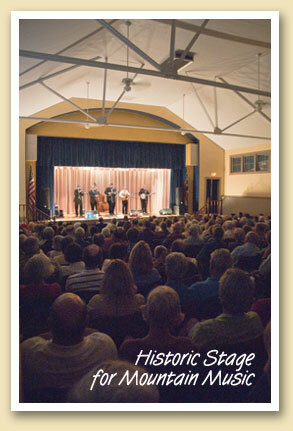 In the ’40s and ’50s, Stecoah’s historic stage (above) was graced by such top bluegrass performers as Flatt and Scruggs, Bill Monroe, and The Carter Family. This year’s 10-concert series begins on June 28 with the internationally-known Kruger Brothers. Other groups include Balsam Range, Dismembered Tennesseans and the Jeff Little Trio. The Bryson City area offers even more music and entertainment options. It’s all in this area performance schedule.